ZCZECIN, Poland — Asafa Powell dominated the field to win the 100 metres in 9.82 seconds, and Tyson Gay cruised to victory in the 200 at the Pedro's Cup on Tuesday. Powell got off to a fast start and was never challenged by the other runners. 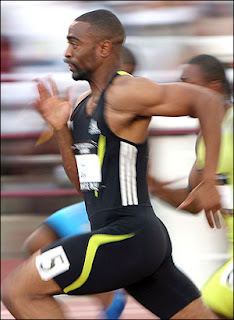 "I wanted to come out here and run very fast for the crowd and everybody," Powell said. Nesta Carter finished second in 10.10, and Jamaica teammate Michael Frater took third in 10.23. Powell had taken bronze at last month's world championships, and finished second last week at the World Athletics Final behind Gay. Gay skipped the 100 in Szczecin, opting to run the 200 instead, and was pleased with his time of 20.21 seconds. "This is the first time I've run the 200 in over a month or so and I haven't really been training for it, so I just wanted to get one under my belt," Gay said. Jeffrey Lawal-Balogun of Britain took second in 20.85, and Ainsley Waugh of Jamaica was third in 21.10.